The review is done following the WSET evaluation criteria. The wine was purchased in Montalcino, Italy, on-site at the winery in 2003 – Donatella Cinelli Colombini. Summary: Quality: good to excellent; Maturity: ready to drink; Value: mid-priced. The wine might be a bit past its prime but it is drinking quite well right now. The wine goes very well with tomato based sauces and pizza. It is clearly an Italian wine with the typical “Italian greenness” combination of flavors and tannins. The greenness is slight and compliments the dried fruit characteristics. The whole berry fermentation used is evident in the fruit intensity even though the fruit is drying out. I can easily recommend this wine. It was purchased in Italy directly from the winery for 5 euros. The wine is easily on par with a $15 to $20 2006/2007 bottle. It would be excellent with most any Italian tomato-based food dish. Disclosure: The wine was a gift from Dr. Xeno. Many thanks to Dr. Xeno for sharing a new wine with me. 2004 Georis Estate Bottled Merlot, Carmel Valley. Clear, dark ruby core with ruby + slightly brickish rim. The change in color at the rim indicates some age/oxidation on the wine. Initial take after opening –> Clean, medium intensity aromas of: green bell pepper, dry cherry, plum, earth, old leather, forest floor, black licorice/anise. After 24 hours of being opened –> Clean, medium+ intensity aromas of: black currant, black licorice/anise, slight dried herbs, tobacco, slight green bell pepper, dried plum. Note: The aroma is much more pleasant after 24 hours. After 24 hours –> Sweetness: dry, Acidity: medium+ to High; Alcohol: medium+, Tannins: medium with slight drying, green tannins; Body: light-medium; Intensity: medium+; Flavors: plum, dried cherry, leather, dried oregano; Concentration: medium-; Length: medium: Note: the flavors are less complex and layered than when first opened. Quality: good; Maturity: ready to drink, but could age another 1 year. The presense of dried fruit / dried herb characteristics indicates the fruit will not be holding up for more than 1 year. The tannins are starting to develop a drying characteristic. Value category: mid-price. The style is old world in nature; very similar to merlot from Bordeaux but not as concentrated as Merlot from Pomerol. The greenness in the aroma and palate would lead me to believe it is from a cool climate site (Carmel Valley makes sense here). If you enjoy cooler climate Merlot, I could recommend this Merlot to you. It is clearly made in an old world style and done fairly well for that style using California fruit. The volume of wine being shipped is still increasing despite a lower number of orders. So, fewer orders but larger wine volumes per order. Last year’s overall increases in wine sales again were driven by table wine, which now accounts for 91.4 percent of the total U.S. wine market. Led by premium varietals, table wine grew 4.3 percent to reach 258 million 9-liter cases in 2007, this on the heels of a 3.7 percent increase in 2006. Much like it did in 2006, imported wines showed a larger percentage gain, at 7.6 percent, than the 3.1 percent gain registered by domestically produced table wine. Still, domestic table wine accounts for roughly two-thirds of the entire U.S. wine market. Champagne and sparkling wine continued to bubble up last year, gaining 3.6 percent to end the year with more than 13.8 million cases, while the vermouth category and dessert and fortified wine sales volumes both declined slightly. Wine club shipments are up slightly for the same 3 quarter period this year vs. 2007. Non-club shipments are down 11%. The data indicates that wine club members are supporting their favorite wineries. The people that do travel to a winery are more serious purchasers than in the past. The cost of fuel is helping to seperate dedicated customers from moderately interested customers. As Marcia Mogelonsky, senior analyst at Chicago-based Mintel, pointed out, “Chocolate, cigarettes and alcohol again seem relatively recession-proof…People might be cutting back or switching to store brands, but they definitely aren’t giving up their small daily indulgences.” The economic slowdown has been drastic yet the wine industry shows that people are still will to spend money on some non-staples. 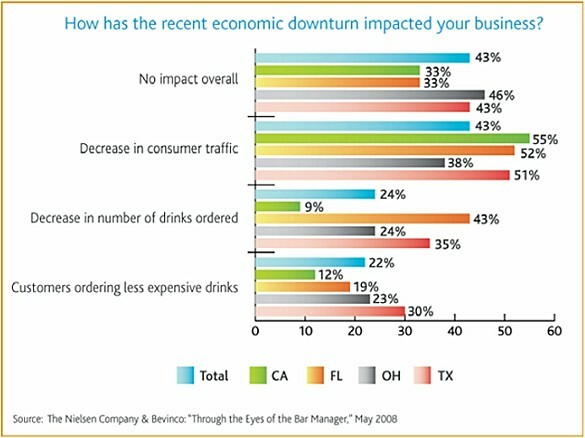 14% report that customers are ordering more well or house drinks. 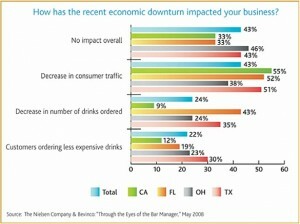 13% report greater sales of beer on draft rather than in bottles. 9% say wine drinkers are increasingly opting for house varieties. People are cutting back on costs — less dining out and less drinking in bars/clubs. Yet, the amount of wine being sold directly is still increasing. So, people must be enjoying more of their favorite wine at home which is a good overall trend for America — a small silver lining in the near perfect financial storm we are all trying to ride out. 12 Nov 2008 Clonal selection — how important is it? I was asked a few days ago about clonal selection for a given varietal, Cabernet Sauvignon, and what difference it really makes in a final wine. My initial impression was that clonal selection of the cultivar(varietal) from a given site is not that important. However, after thinking about this for a day or so, I have a different point of view. My initial thoughts were based on key assumption — the vineyard was planted with the exact perfect clonal selection and rootstocks for each block’s soil, weather, water and temperature conditions. This is a very large assumption on my part. It is nearly impossible to get the perfect match of clone, rootstock, capopy management, water regime, nutrient regime, etc the first time for a vineyard manager. There is a reason why it takes decades to determine the best varietals for a given area/vineyard, let alone a specific set of clones. From a winemaking perspective, clonal selection is very important when a vineyard is young as some clones match up better with the specific growing conditions than others. Each clone is going to express different elements more boldly than other clones. Clonal differences such as cluster density and cluster size make a large difference in areas that have rain during the ripening season, heavy fog, etc — a loose cluster will be able to dry out more easily and have a lesser tendency to develop fungal issues than a tightly packaged cluster would be able to dry off. Each clone is going to bring different nuances to your finished wine. For each wine, I have a particular style and flavor profile that I am looking for. I will try to select a mixture of clones when possible to give me more flavors / aromas / tannin profiles to work with for the final blend of the wine. It is the same concept as a painter wanting to have more shades of a autumn colors when painting an Autumn scene — more gradiations, great more depth and interest in the viewer. A wine from a selection of clones should have a more layered and complex profile than a wine from a single clone. If a specific clone gives you just what you are looking for, then fabulous — enjoy the great wine! If not, you will need to either make up for the missing element by blending in wine from another location or use some additional clones of the same varietal. From a growers perspective, clonal selection is very important but for slightly different reasons. Clones are selected based on the easy of growing healthy grapes (cluster size, cluster density, flower period, degree of millerage, evenness of ripening), yield, heat tolerance, drought tolerance, etc. The type of grower makes a large difference on what elements they focus on — a bulk grower is selecting clones for highest yield, highest disease and fungus resistance, larger berry size; while a quality grower is looking for small berry size, low yields of highly concentrated berries, particular tannin profiles, rarity of the clone (premium value for a desired clone), etc. Clone 7 according to Winemaker Phillip Corallo-Titus of Chappellet Winery: considered perfect match for our rocky, volcanic soils. The fruit it produces is valued for the rich, forward blackberry and casis flavors and balanced tanninns. Clone 337 is considered to be one of the best selections for Napa Valley high-end wines. Yet, Clone 337 has shown some poor terroir results in Sonoma County hillsides if the cultivar was matched with the wrong rootstock and had low water availability. Clone 337 is considered to be quite fruity and has a depth of flavors. Clone 7 is considered to be rustic (aka rough tannins) compared to Clone 337. Other say that Clone 7 is just fine when not grown on hillsides. My conclusion is that clonal selection is very important for growing the best possible fruit for a given location with the realization that each person’s view of what is the best is subjective. Some combinations of specific clones on a given site will produce more concentrated and healthier fruit that others. If that combination produces grapes that suits your wine style, then you are a very happy grower/winemaker. If not, you need to either try another combination or look at a different location to grow/source your grapes from.